By Scott Gilfoid: Eddie Hearn says the winner of this Saturday’s fight between Matchroom Boxing stable fighter Dillian Whyte and former WBO heavyweight champion Joseph Parker will soon be getting a world title shot. What’s interesting is Hearn didn’t just come right out and say that the Whyte-Parker winner will get penciled in for the April 13th slot against Anthony Joshua at Wembley Stadium in London. The reason for that is obvious. If Parker beats Whyte on Saturday, Hearn is expected to stick his recent Matchroom signee Jarrell ‘Big Baby’ Miller in with Joshua on April 13. In other words, Parker likely has no shot at a quick rematch against Joshua next April no matter what Hearn says. A Parker victory on Saturday just means he stays in the hunt for a future title shot against AJ, but it doesn’t mean he’s going to get the April 13 fight. The odd man out for the April 13 fight against Joshua is WBC champion Deontay Wilder, who appears to have zero chance of getting the fight. The $15 million flat fee offer given by Hearn to Wilder is a not so gentle hint that he’s not wanted for the fight. This is not a percentage deal that you would expect a popular champion to get for a huge money unification fight. Wilder is being offered just a flat fee for a fight that could bring in $100 million. One big hint that Wilder has no chance of getting the Joshua fight on April 13 is the fact that AJ doesn’t want him to enter the ring on September 22 for his fight against Alexander Povetkin unless he signs the contract for the April 13 fight. I think Hearn is getting a little carried away with himself in talking up the Whyte-Parker fight for Saturday. Yeah, he fight has reportedly sold out the O2 Arena in London, England for Saturday night, but it’s a fight that has hardly got the “imagination of the public.” I mean, there’s scant interest from boxing fans in the Whyte vs. Parker fight on social media. There’s not much talk at all about this fight. Heck, it’s almost as if they’re not fighting. Why is that? Well, probably because many of the boxing fans see Whyte and Parker as B-level fighters, and not the supremo talents in the heavyweight division. The fans want to see Deontay. If Whyte is going to fight anyone, he should be facing the 6’7” Wilder. Now that’s a fight that would catch the imagination of the public. Hearn could have made that fight if he had agreed to give Wilder his $7 million asking price. That’s chickenfeed obviously compared to the $50 million that Wilder’s management offered Joshua for a unification fight, which he turned down. Why did Joshua turn down $50 million to fight Wilder? Only Joshua knows the answer to that. Parker needs to be thinking knockout if he wants to get the ‘W’ on Saturday. If it goes to the cards, I think he’s going to be unhappy with the results. Parker is after all the visiting fighter on a Matchroom promoted card in Whyte’s hometown of London, England. That tells you what Parker is up against. He probably needs a knockout for him to win. 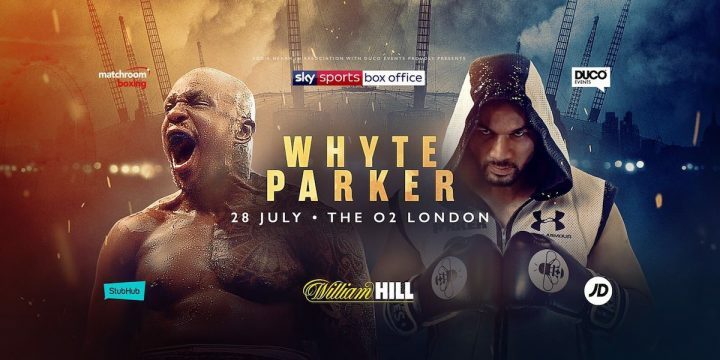 ‘The Body Snatcher ‘ Whyte vs. Parker will be shown live this Saturday night on July 28 on Sky Box Office at the O2 Arena in London. The tickets are sold out for the show. The likely reason for that is because the British boxing fans believe that Whyte will be getting Joshua next on April 13 if he beats Parker. This is a fight that will likely be picking Joshua’s next opponent after his September 22 title defense against his WBA mandatory challenger Alexander Povetkin at Wembley Stadium. Whyte and Parker have one thing in common. They both lost to Joshua in the past. The difference is Parker at least finished on his feet in losing a 12 round unanimous decision on March 31 in Cardiff, Wales. Whyte was knocked down and counted out in the 7th round in his loss to Joshua on December 12, 2015. It goes without saying that Parker was more competitive against Joshua than Whyte was. What’s interesting is Joshua is pulling for Whyte to win Saturday’s fight. He thinks it’ll be a bigger fight between him and Whyte in the UK than it would if he were to face Parker again. I think Joshua is right. There’s clearly more interest from the UK boxing fans in a second Joshua-Whyte fight than there is between AJ and Parker. That doesn’t mean the Joshua vs. Whyte II holds interest for the fans outside of the UK. The non-British fans don’t care about a retread fight between Joshua and Whyte. That tired match has been done already and it holds no interest for fans outside of the UK. The fans want to see Joshua step it up against Wilder, not face Whyte again. The undercard for the Whyte vs. Parker fight is a real disappointment with Dereck Chisora facing Carlos Takam, Katie Taylor fighting Kimberly Connor, light heavyweight Joshua Buatsi battling journeyman Andrejs Pokomeiko (17-14-1), welterweight Conor Benn fighting journeyman Cedrick Peynaud (6-5-3) in a rematch, Nick Webb facing David Allen at heavyweight, Anthony Fowler battling Craig O’Brien, light heavyweight Frank Buglioni taking on journeyman Emmanuel Feuzeu. Most of those fights will be won by the A-side. I mean, I can’t see any upsets in those matches. The only 50-50 fight of those scheduled bouts is the Chisora vs. Takam fight. That’s definitely a bout that could go either way. Chisora (28-8, 20 KOs) and Takam (35-4-1, 27 KOs) will be fighting for the vacant World Boxing Association International heavyweight title.